Transmission electron microscope image of negative-stained, Fortaleza-strain Zika virus (red), isolated from a microcephaly case in Brazil. Image courtesy of National Institute of Allergy and Infectious Diseases. 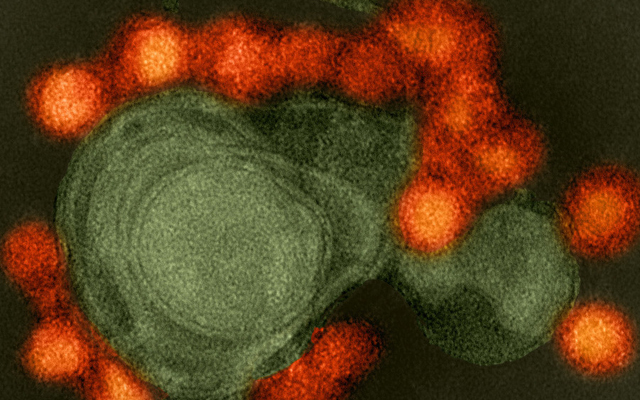 In both cell cultures and mouse models, a drug used to treat Hepatitis C effectively protected and rescued neural cells infected by the Zika virus — and blocked transmission of the virus to mouse fetuses. Writing in the current online issue of the journal Scientific Reports, researchers at University of California San Diego School of Medicine, with colleagues in Brazil and elsewhere, say their findings support further investigation of using the repurposed drug as a potential treatment for Zika-infected adults, including pregnant women. “There has been a lot of work done in the past year or so to address the Zika health threat. Much of it has focused on developing a vaccine, with promising early results,” said senior author Alysson Muotri, PhD, professor in the UC San Diego School of Medicine departments of Pediatrics and Cellular and Molecular Medicine, director of the UC San Diego Stem Cell Program and a member of the Sanford Consortium for Regenerative Medicine. Outbreaks of Zika virus in Brazil in 2015 and 2016 were marked by an increased incidence of newborns with congenital malformations, most notably undersized heads (microcephaly) and significant neurological abnormalities. A great deal of research has focused on the pathology of Zika infections, including earlier work by the Muotri lab and collaborators that described how the virus is transmitted from mother to fetus by infecting cells that, ironically, will later develop into the brain’s first and primary form of defense against invasive pathogens. In its latest work, however, the Muotri lab sought clinical solutions. The team investigated an antiviral drug called sofosbuvir, approved and marketed under the brand name Sovaldi to treat and cure hepatitis C infections. The drug works by inhibiting replication of the hepatitis C virus; researchers noted that both hepatitis C and Zika belong to the same viral family and bore strong structural similarities that could make sofosbuvir effective against the latter. In addition, it had been reported that sofosbuvir was protective against Zika in different cell types. In tests using human neural progenitor cells (NPCs) — self-renewing, multipotent cells that generate neurons and other brain cell types — the scientists found that exposure to sofosbuvir not only rescued dying NPCs infected with the Zika virus, but restored gene expression linked to their antiviral response. In subsequent tests using an immunodeficient mouse model infected by Zika, intravenous injections of sofosbuvir significantly reduced viral loads in blood serum compared to a placebo group. Moreover, fetuses of Zika-infected pregnant mice did not show detectable Zika virus amplification in the sofosbuvir-treated group. “This suggests that one, the drug was well-tolerated by the Zika-infected pregnant mice and two, more importantly, that it was able to arrest Zika replication in vivo and stop transmission from mother to fetus,” said Muotri. Co-authors include: Pinar Mesci, Angela Macia, Spencer M. Moore, Leon Tejwani, Isabella R. Fernandes, Nicole A. Suarez, Sandro Montefusco, Jeremiah D. Momper, and Jair L. Siqueira-Neto, all at UC San Diego; Sergey A. Shiryaev, Antonella Pinto and Chun-Teng Huang, Sanford Burnham Prebys Medical Discovery Institute; Matthew J. Kolar and Alan Saghatelian, Salk Institute for Biological Studies; Scott C. Rosenberg, UC San Diego and Ludwig Institute for Cancer Research; Roberto H. Herai, Pontificia Universidade Catolica do Parana, Brazil; Fernanda R. Cugola, Fabriele B. Russo, and Patricia C.B. Beltrao-Braga, University of Sao Paulo, Brazil; Nicholas Sheets, and Sujan Shresta, La Jolla Institute for Allergy & Immunology; and Kevin D. Corbett, Ludwig Institute for Cancer Research. Funding for this research was provided, in part, by the California Institute for Regenerative Medicine (DISC2-09649), the National Institutes of Health (U19MH107367), UC San Diego Stem Cell Program, the NGO “Tooth Fairy Project,” and NARSAD (F30DK112604). Disclosure: Muotri is a co-founder and has equity interest in TISMOO, a company dedicated to genetic analysis focusing on therapeutic applications customized for autism spectrum disorder and other neurological disorders with genetic origins. The terms of this arrangement have been reviewed and approved by the University of California San Diego in accordance with its conflict of interest policies.